Are you ready to pirate up this incredible game? Puzzle Cross is THE BEST pirate puzzle adventure, and it is not only us that say so, but the more than 50.000 players playing enjoying it. NONOGRAMS, PICROSS AND SHIPS! 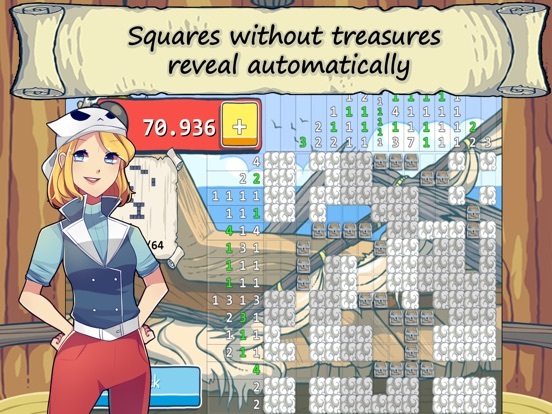 Nonograms, as well known as picross, hanjie or glidders, are picture logic puzzles, perfect to challenge your brain and show your mental ability. HOW TO PLAY As soon as you enter our game you will be instructed on how the game play works. It is very simple you just need to boom, conquest, steal, run, hide, discover, and being a good pirate. Pretty simple, right? Well… be aware because there a limited number of bombs, so you might want to use them wisely. You need to know how to boom and how to sail correctly in this adventure otherwise you will be lost instantly, and who knows, maybe a giant sea monster will sink your ship. First of all, stay calm and pirate up Once you discover this pixelart, you will be lost… in the middle of the ocean. Over all. 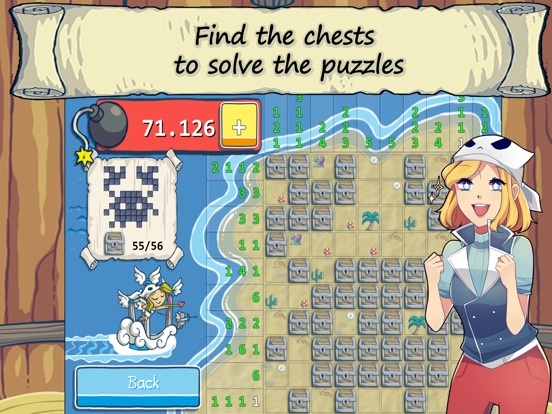 It is about to have fun, and solve this incredible cross puzzle adventures IMPROVE YOUR MENTAL ABILITY WHILE PUZZLING Enjoy the fantastic world of picross (japanese picture crosswords), a funny puzzle where through numerical hints you will draw awesome pixelart pictures! 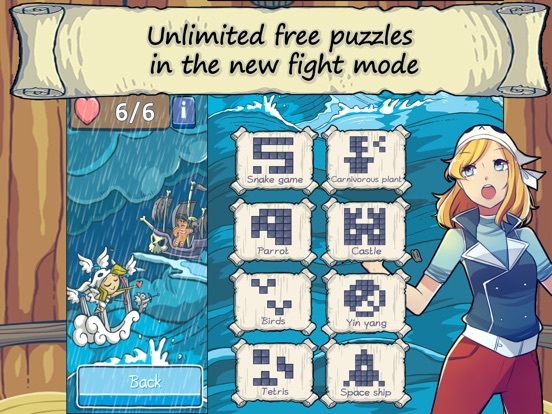 Best puzzle game with pirates and sea rovers. Conquest all the world and the islands nearby. 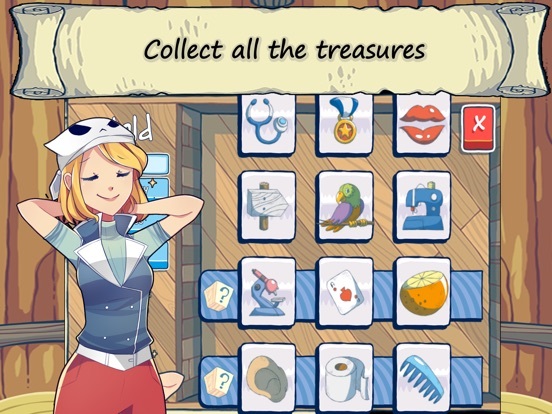 If you are ready to find hidden treasures and collect them in this fascinating pirate adventure while you are solving incredible puzzles; then you are lucky, because this app was perfectly design and develop to have lots of fun in the seven seas. 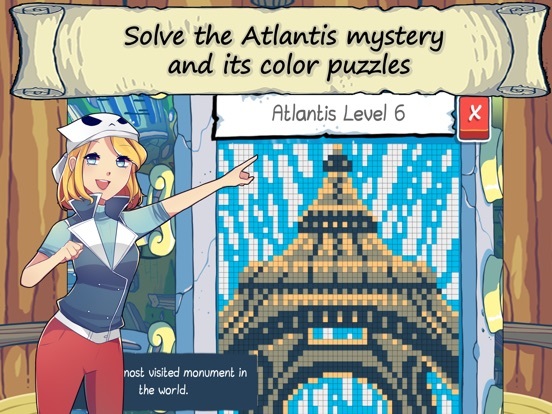 The magic map will lead you to incredible treasure and more magic maps that will guide you along this journey so you won’t be lost while sailing Don’t wait no longer to have fun and try out this new type of pixel puzzle adventure. 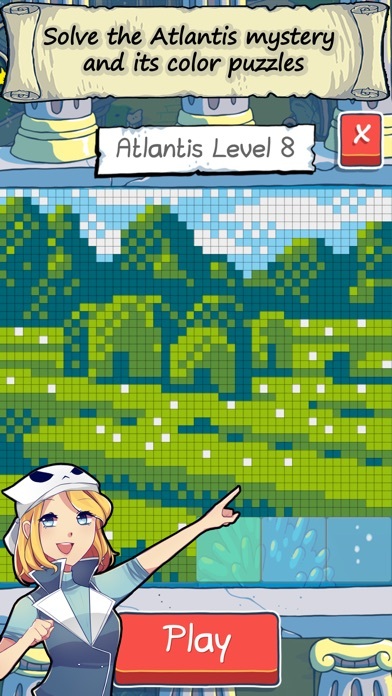 If you are bored to play the typical match 3 game, then give it a try and discover picross apps. Shoot the cannon ball and take your inside pirate out, what are you waiting for? 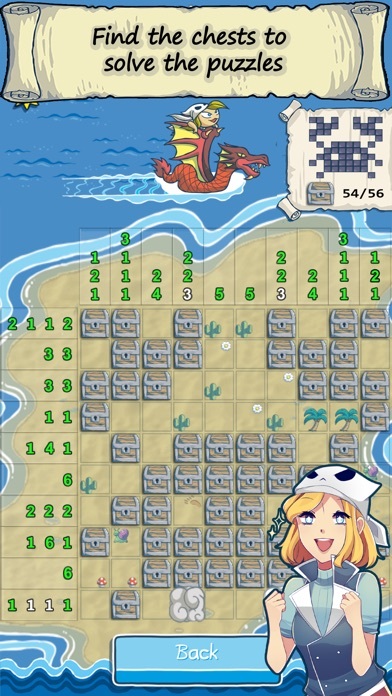 MAIN FEATURES - The only one picross game that reveals the squares where there are no chests without clicking them. - Pirate music - Boat upgrades to face challenges even better. - Free shoots packs every day. - Funny animations. - Pirate powers that will let you reveal the whole row or column. - Improve your mental ability while enjoying. Awwww... looks nice, I'll give it a spin! There's really nothing special about the puzzles. Mostly 5x5 grids and I saw a few larger 6x6 grids. The pirate theme is cool. Free does come with a catch and that's with limited cannonballs to fire at the puzzle board. They do offer more shots every day, though I wouldn't expect very many awarded. IAP is consumable. There's a massive difference between the 100 shot 99c pack and the most expensive $4.99 pack of 5000. 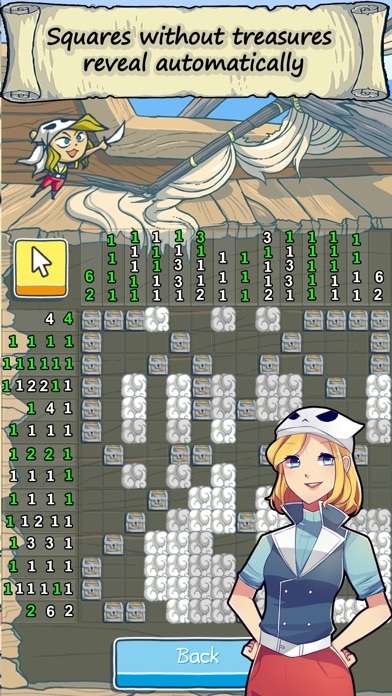 Puzzles aren't that hard, and the theme is great, perfect picross for my daughter. It really surprises me how expensive consumable IAP is these days. $20 for a pile of coins/gems/etc.? Mr. Developer, sir - if I might suggest a $1.99 IAP (or maybe $2.99) that increases (doubles) the number of shots you get each day, that might be a much better deal for consumers (and get you more purchases.) If you look at many freemium titles, many have a "coin doubler" which is very popular. Game is polished but it you can only play for 5 minutes. And the description makes it sound like it's the only free to play picross. I want to thanks everybody who has given a try to my game! This sounds very interesting, thanks a lot for the tip! Also I hope your daughter enjoys the game! Thanks for the tips guys, any feedback is appreciated! What does the boat upgrades do? It seems to just change the pic in the lower left. Not a bad piccross game. I played it until I ran out of bombs. I don't fully understand why boxes around the chests open up. Most piccross games just allow you to mark off areas that you know don't contain the "chest". Nice design, more suited I guess for the younger set. Still, it's enjoyable. It might be nice to have an unlocked IAP, maybe still limiting advancement to new levels based on completing previous levels. Just a thought. Doesn't even load for me. Briely displays the splash screen and then closes. Looks like fun. Love the Windwaker-ish feel I get from the screenshots. Kudos to the Dev. Free to play Picross?? Too many good picross games that are IAP free can be found on the iOS store. I'll stick with those. This one seems like a very casual version of the genre. I don't like that it fills in the blank spaces for you. Too casual. 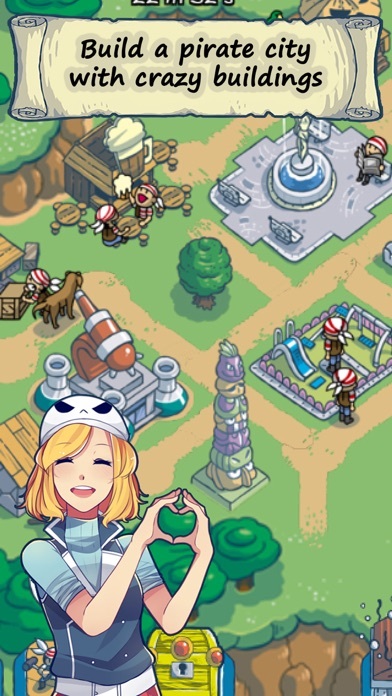 Logic Dots is an excellent example of IAP done right. The only thing they sell you is hints... And it's an excellent game. Still playing. I've noticed though, when you start a puzzle, and you don't have enough bombs, and you leave, when you come back, any bombs you have used to take care of part of that puzzle are gone, but the progress is not saved. I've been enjoying the game, I wouldn't mind paying for some kind of full game unlock, not a fan of the consumable IAP. Instead of $4.99 for 5000 cannon balls, I'd like to just pay that amount for the game, especially if 5,000 is enough to complete the game. Future level packs could always be added for a price similar to Tiny Thief or Monument Valley. This is similar to Paint It Back, that game also featured a full game unlock. I don't mind blank spaces auto filling in, gives it a more casual feel than similar games where you place an X where you think a blank space will be. The way the game is right now, I'd rather pop in and collect the boxes then close the app to hoard cannon balls than to make an in game purchase. If it had a full unlock, I would have already purchased it. I unlocked a few of the higher ranking boats before running low on cannon balls. When you scroll through the world map, some islands are unlocked just by working your way through the islands (levels). Other levels require player progress and upgraded boats. I wouldn't mind paying for some kind of full game unlock, not a fan of the consumable IAP. Instead of $4.99 for 5000 cannon balls, I'd like to just pay that amount for the game, especially if 5,000 is enough to complete the game. @SheepVsGravity are you also using the ipad retina ? i guys, I have pushed to the appstore a new version that should fix the compatibility problem with the iOs 7.x any of you can check if its really solved?? 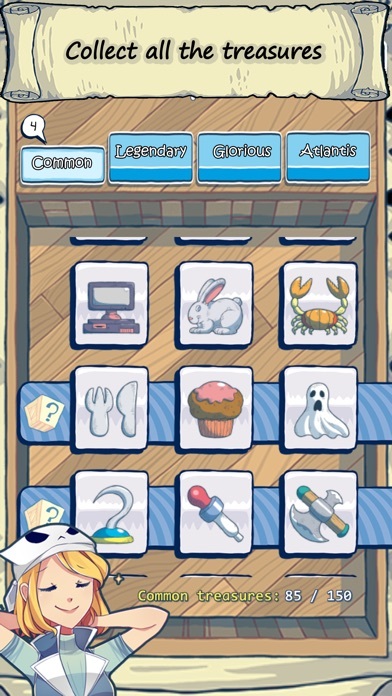 Fun game, nice easy puzzles. What is the largest size in the game?